This splendid, architecturally rich turn of the century building, was opened in 1896 to serve the recently built housing community as the town spread northwards towards Broadwater. 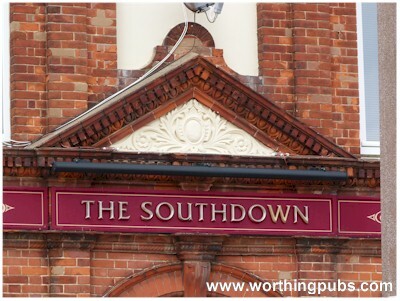 The name is thought to have originated from the Southdown breed of sheep. 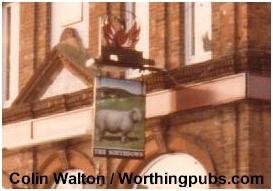 A picture picture taken by Colin Walton in 1983, seems to back up the origin of the pub name, clearly a Southdown Sheep. 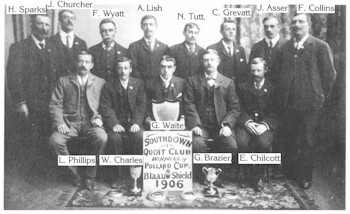 The 1906 Southdown Quoits Club. 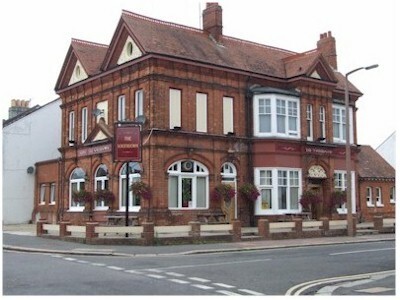 You will see a couple of landlords in the team such as G Brazier and C Grevatt and F Wyatt who might have been the landlord of the John Selden in Salvington Road. 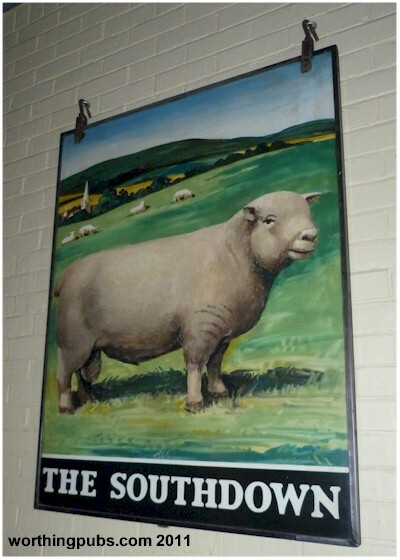 The original Southdown lamb pub sign, now preserved safely inside the pub. 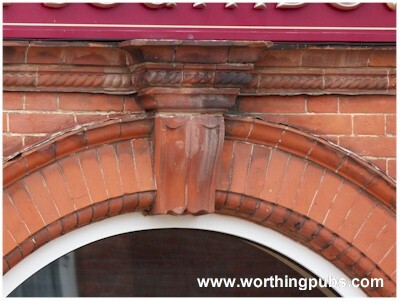 It would appear that it was removed in the 1920s when the building became a school, something that only lasted for around 6 years. 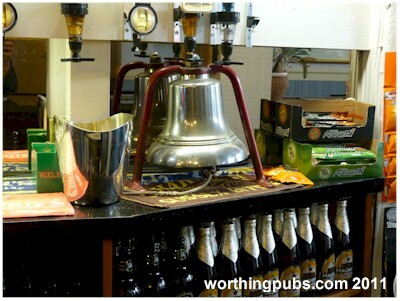 Fortunately, the sign was stored in the cellar until eventually returned to its original position. 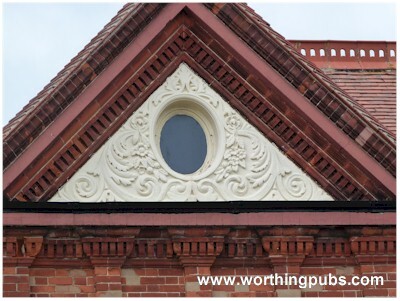 My memory of the pub is somewhat vague, as it had been some 30 years since my last visit, but I did remember that the bar area was 'roofed' with green glazed terracotta tiles, something I mentioned to the landlord in conversation. His reply momentarily stunned me . 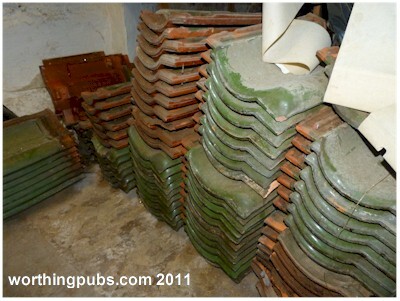 . . he still had them, stacked up in the cellar. Would I like to see?........ Oh yes!!! 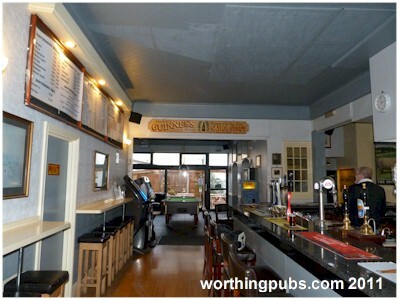 What a transition from my memories of a rather dark and enclosed pub. 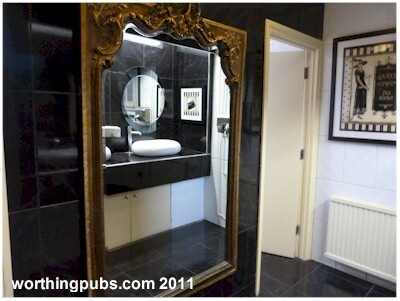 Sharp clean lines, that even carry on into both toilets. 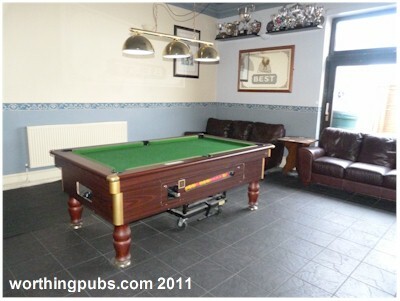 The single long L shaped bar, covers the three zones - drinks and chat, relaxing corners and a sports section. 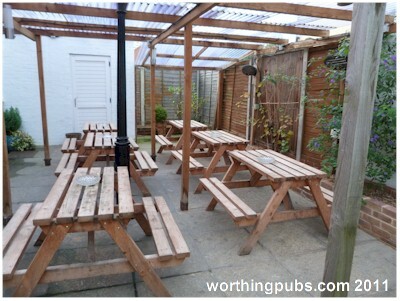 The landlord informs me, that since the smoking ban, he has been able to bring in better quality furniture and promote the business as a family pub. 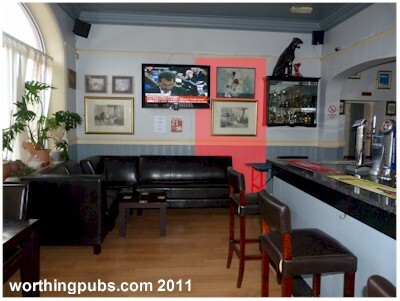 This section, just around the corner from the main door, was the hotel manager�s personal lounge. Hence the small fire place and internal window to its left, allowing him to see anyone entering, what was then, the hotel section. 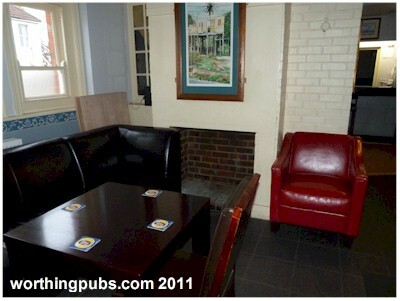 Looking on the other side of the fireplace reveals the old reception area. 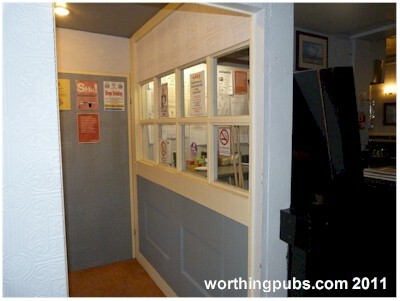 The section we've coloured red, shows signs of a pre-existing doorway, behind which is the ladies� toilets. 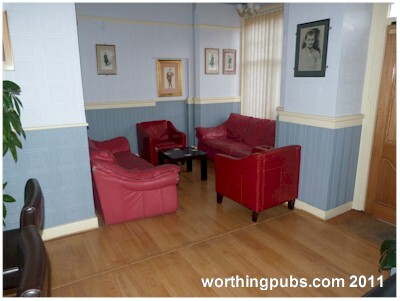 We suspect this used to be the off-sales room. Close up of a section of that wall reveals a key way or hook ring. 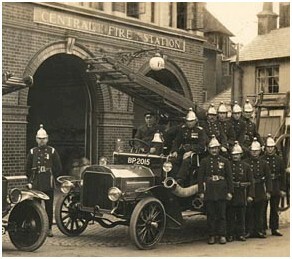 South Glamorgan Fire Service, so it's Welsh. 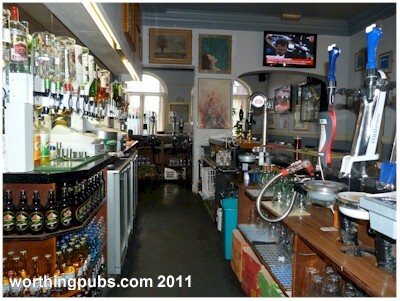 The off sales were accessed from king street by a door which formed the left hand side of the bay window. The toilets if my memory serves me correctly, were accessed through a door located on the south wall of the sports area. 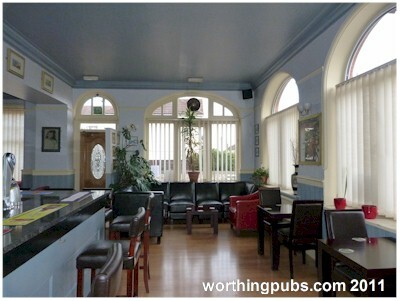 The pub was originally divided in to two areas , the division being where the arch shows in the picture. Access to the toilets were through a doorway in each section. 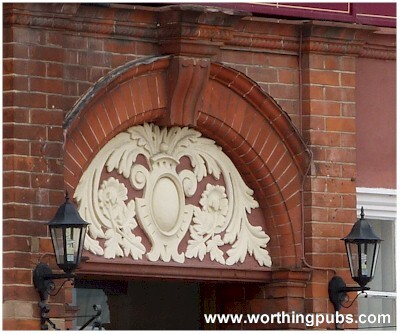 1935: Worthing Old Comtemptables Association, made up of soldiers who fought at Mons in 1914, was based at the Southdown Hotel, North Court Road.